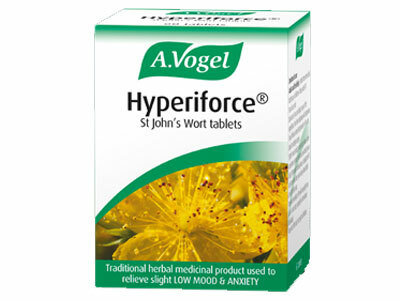 We sell A. Vogel (Bioforce) products like A. Vogel Hyperiforce® St. John's wort 60 tablets - herbal remedy for low mood and mild anxiety online in the UK and directly from our award-winning store in Scotland. Hyperiforce® St. John's wort (or hypericum) is one of our more well-known herbs and has a long history of use as herbal medication for the nervous system. Where can you buy real Hyperiforce 60 tablets safely online? If you are wondering where you can buy A. Vogel Hyperiforce® St. John's wort 60 tablets - herbal remedy for low mood and mild anxiety safely online in the UK, then shop with us. Hyperiforce 60 tablets - A. Vogel Hyperiforce® St. John's wort 60 tablets - herbal remedy for low mood and mild anxiety in Sleep & Relaxation and Herbal Remedies, Tinctures & Supplements.